However Tiffany’s most stunning glass work was on a much grander scale. He became interested in glass making from about 1875 and worked at several glasshouses in Brooklyn between then and 1878. In 1879 he joined with Samuel Colman and Lockwood de Forest to form ‘Louis Comfort Tiffany and Associated American Artists’. Tiffany’s leadership and talent, as well as his father’s money and connections, meant his business thrived. His desire to concentrate on art glass led to the breakup of the firm in 1885, when Tiffany chose to establish his own glass making firm later that year. 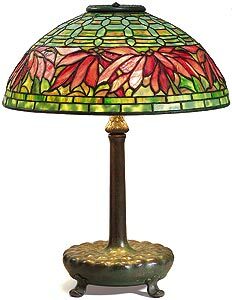 The first Tiffany Glass Company was incorporated on December 1st 1885, and in 1900 became known as the Tiffany Studios. Tiffany used opalescent glass in a variety of colours and textures to create a unique style of stained glass. This can be contrasted with the method of painting in glass paint or enamels on colourless glass that had been the dominant method of creating stained glass for several hundred years in Europe. Use of the coloured glass itself to create stained glass pictures was motivated by the ideals of the Arts and Crafts movement and its leader William Morris in England. Fellow artist and glass maker John La Farge was Tiffany’s chief competitor in this new American style of stained glass. Both La Farge and Tiffany had learned their craft at the same glasshouses in Brooklyn in the late 1870’s. In 1893 Tiffany built a new factory called the Tiffany Glass Furnaces, which was located in Corona, Queens, New York. In 1893 his company also introduced the term, Favrile, in conjunction with the first production of blown glass at his new factory and some early examples of his lamps were exhibited in the 1893 World’s Fair in Chicago. Tiffany has long been associated with exquisitely beautiful and exquisitely crafted objects and Tiffany pieces produced at the turn of the last century can be very expensive. The Worlds press routinely feature reports of Tiffany glass lamps and iridescent vases selling at auction for tens, and sometimes hundreds of thousands of pounds. Antique Tiffany pieces are popular and therefore expensive, because they are distinctive, innovative and skilfully crafted. The complex designs and quality of workmanship obvious in the glass and metalware that originate in the creativity and dedication of one man: Louis Comfort Tiffany (1848-1933). 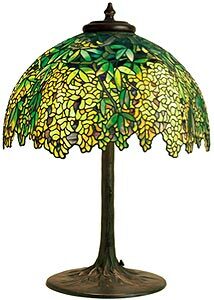 In 1997, Christies auction house sold a tiffany Lotus lamp, formed from a delicate arrangement of stained glass, for a record-breaking £1.5 million. However, it is still possible to find more affordable objects produced by the company. As the son of Charles Louis Tiffany, the founder of the successful multi-million dollar Tiffany & Co. jewellery business, Louis Comfort Tiffany was originally expected to oversee the family firm. Instead he chose to make his own unique mark on the world by following his passion for the creative arts and employing the good business sense he inherited from his father. After studying as a painter, Tiffany established a successful interior design company, Louis C. Tiffany & Associated Artists and from the mid-1870s, the company was very much in demand by wealthy society members with both Mark Twain and the White House featuring on the Tiffany client list. While working on his interior designs, Tiffany developed his long held fascination with glass, which he used extensively in his restyled interiors. As a student, he had studied glass-blowing and started experimenting relentlessly with new techniques. In 1881 he patented his unique type of iridescent glass, named ‘Favrile’ which is german for handcrafted. Favrile glass departed from the fashion for decorating pieces with painted designs and instead was sprayed with metallic lustres to create an opalescent and multi-dimensional finish. In 1885 Tiffany established a new company, which was later named Tiffany Studios, to focus on the development of innovative freeblown glass vases which he produced commercially from 1894. The Art Nouveau style influenced the shape and design of his pieces, but in he maintained the principles of the Arts and Crafts movement and objects were skillfully hand-finished to the highest standard. His distinctive ‘Jack-in-the Pulpit’ and slender floriform vases are particularly sought after today and prices can range from £500 to tens of thousands of pounds. Simpler vase shapes were decorated with a huge variety of techniques such as feathering, painting and threading. Some shapes were so complex that they took many months to produce. Although highly regarded for his glass vases, it is the dazzling and distinctive array of handmade lamps and shades that Tiffany is now most widely known for. As a young man in Europe, Tiffany had been struck by the beauty of stained glass church windows and had used decorative windows in his work as an interior designer. He realised that the tremendous effects of daylight through coloured glass could be recreated in the domestic interior using artificial light and lampshades would be a perfect medium for this work. 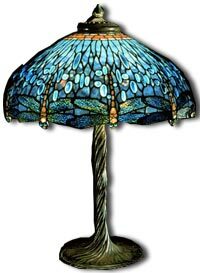 The first Tiffany leaded shades included ‘Nautilus’, ‘Dragonfly’ and ‘Wisteria’ and by 1906 he had over 125 different styles on sale. Generally hemispherical in shape, Tiffany lamp shades were made from tiny fragments of glass held together by lead. Earlier pieces tended to be simple with geometric designs using only one or two colours. Then after extensive experimentation Tiffany had over 5,000 colours at his disposal, and he utilised these to reproduced the subtle variety of tones found in nature. Over time Tiffany lamp decoration became more complex and colourful, featuring flowers, fruit and insects in highly ornate arrangements. Natural designs that featured irregular shaped borders required the highest level of skill to produce and are highly collectable and extremely valuable today. With prices ranging between £5,000 for a simple single colour shade to over a million pounds for the most rare and exquisite examples. His successes with art glass vases and leaded lamps then lead Tiffany to international acclaim. However, Tiffany did not limit himself to the production of glass; he excelled in designing silver, jewellery and bronze objects. Among these were affordable household items such as lamp bases, desk accessories and clocks. Some of these items were retailed through Tiffany & Co., which he presided over after the death of his father in 1902. Tiffany’s metal pieces can be more affordable than much of his glassware and allow collectors on tighter budgets to own a sample of the great designers work. A patterned bronze ashtray might cost around £200-300, while enamelled gilt-bronze bookends can fetch in the region of £1,000-2,000. Although, prices can rise to tens of thousands for more unusual items, such as a bronze inkwell with turtleback panels. Most metalware is marked “Tiffany Studios, New York”, but as with tiffany glass, there are a great many fakes on the market. After many years of success, Tiffany Studios closed in 1932. Tiffany & Co. are still in business and continue to produce high quality silver, jewellery and glass today. 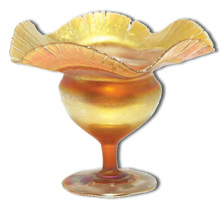 Collecting tiffany Glass … If you’re looking to add to your Tiffany glass collection, why not have a look through our Tiffany Glass for Sale section.